If you’re a tax accountant hoping to enhance your career, you can’t go wrong with the enrolled agent designation.To become an enrolled agent, you must pass the Enrolled Agent (EA) exam (also known as the Special Enrollment Examination or SEE). But don’t let that discourage you from the EA. When you consider the Enrolled Agent exam pass rate, you can see that your chances for exam success are good. I’ll show you the latest EA exam pass rates so you can understand the difficulty of the exam and how to pass it. This table provides the Enrolled Agent exam pass rates for each part from the last several years. If the EA exam pass rates look high to you, that’s because they are. Take a look at how the EA exam pass rates compare to the pass rates of the CPA, CMA, and CIA exams. Considering the pass rates of these other popular accounting exams, the EA exam pass rate is encouraging. It’s a full 20% higher than the CPA Exam pass rate. 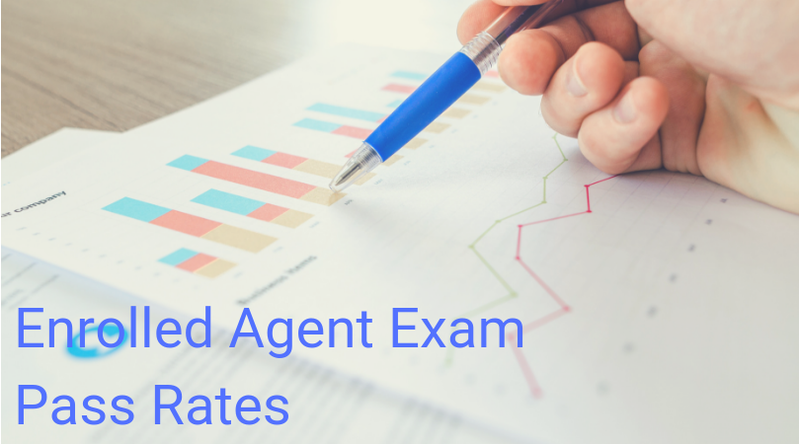 While these pass rates may make the Enrolled Agent exam seem easier than other exams, we shouldn’t jump to this conclusion. After all, the passing score largely affects the pass rate. And the passing score is a conscious decision of the examiners. Also, the natures of the major professional accounting certifications exams are quite different. But based on the feedback from my readers who have completed both the CPA and EA exams, they seem to agree that the CPA Exam is harder. Some readers have pointed out that the coverage on the CPA Exam is a lot broader. Also, others feel that the EA exam questions are less tricky. In this case, the pass rates do seem to indicate relative difficulty among professional accounting exams. However, the high EA exam pass rate percentage does not indicate is that the exam is easy. Instead, what this percentage tells us is that passing the EA exam is completely possible. If you put the time and effort into your studies, you can be completely ready to pass each part. You can even pass on the first try. You just need to use the right EA review course for you and follow your study schedule consistently. So, what makes the EA exam pass rates rise and fall? Is it the difficulty of the exam? The testing center that administers the exam, Prometric, advises against drawing this conclusion due to significant discrepancies in candidate populations. Prometric releases the pass rates several times a year. With each release, Prometric explains that not all candidates take all 3 of the EA exam parts. Nor are the exam parts taken in a particular order. Consequently, there are big differences between the candidate populations for each exam part. However, the additional pass rate information we get from Prometric does have some implications. With such variations in candidate populations and other factors coming in to play, we cannot assume the pass rates tell us which part is harder than the others. To investigate that matter, you should consider the feedback of enrolled agents and the content of the exam parts. The Part 1 syllabus contains the most content areas, while Part 2 contains the fewest. Yet the number of content areas is not as important as the topics within those content areas. The topics covered will be the biggest indicator as to which exam part could be the most challenging for you, as the personal knowledge and background you bring to the exam determine how much you have yet to master. Because your own knowledge levels affect how hard the EA exam will be for you personally, one major influence on EA exam pass rates is candidate preparation. Despite the high pass rates in these SEE exam statistics, the Enrolled Agent exam is challenging. It remains a long and complex assessment of your familiarity with a great deal of federal taxation and tax accounting information requiring you to answer hundreds of multiple-choice questions. The only way you can pass the EA exam is to study well for several months. To ensure that you study effectively until exam day, you must create an EA exam schedule that leads you through an EA review course. With the best EA review course for you, you can be completely ready to pass the exam and even pass it on your first attempt. Another circumstance that can impact the pass rates is EA exam changes. The Enrolled Agent exam will begin testing on the Tax Cuts and Jobs Act when the next testing window opens on May 1, 2019. The Tax Cuts and Jobs Act was signed into law in December 2017 and accomplished a major tax overhaul, the likes of which have not been seen since 1986. The exam will start testing this law in its entirety next year, and this significant exam change could affect the pass rates. Three years ago, Part 1’s pass rates were doing well. Among the 3 exam parts, Part 1 was in second place with pass rates touching 80%. But then, the Part 1 pass rates took a turn for the worst. In 2016-2017, these pass rates tumbled by as much as 15%. Now, Part 1 possesses the lowest pass rates, with percentages resting in the 50-70% range. However, the percentages have improved slightly for Part 1. The 2018 Part 1 pass rates are now just 3% lower than the Part 2 and Part 3 pass rates of 2018. Though that year saw the lowest Part 2 pass rate dive 30% lower than the highest Part 1 pass rate, Part 2 has been bouncing back ever since. The 2017-2018 passing percentages remained firmly within the 60-70% lane and ended almost 10% above those of Part 1. These pass rates are all so healthy that none of them should really give you pause, but if you need any extra convincing that the EA exam is completely passable, Part 3 is here for that. The Part 3 pass rates have been both closer knit and noticeably higher than those of Part 1 and Part 2. For one brief moment in the 2016-2017 testing window, the Part 3 percentage sunk below 80%. Yet, at all other times from 2015-2018, the Part 3 pass rates have camped out in the 80-90% range and have even pushed up above 90%. With the final average pass rates for the last 3 testing windows all firmly embedded above 80%, Part 3 seems to have made its pass rate home in the highest percentage territory. So, is Part 3 the easiest? Again, Prometric warns us against this conclusion because different candidates may have taken different parts. Therefore, many factors are at play here. However, in my opinion, the high pass rates for Part 3 do have some sort of indication on the relative difficulty. Furthermore, many of my readers consider Part 3 to be the easiest. The yearly view of the EA exam pass rates helps us reach a more accurate understanding of the trends. When we pull back a bit, we can see that it’s actually Part 1and Part 3 that have been a pair historically. Though Part 1 had the lowest pass rates for 2 years running, its pass rates gave the Part 3 pass rates a run for their money for a good while in the recent past. Part 2 boasting higher pass rates than Part 1 has only been a recent development. In fact, Part 2 has been in last place most often in the last 10 years. For just as long, the Part 3 pass rates have been the highest and the Part 1 pass rates the most varied. 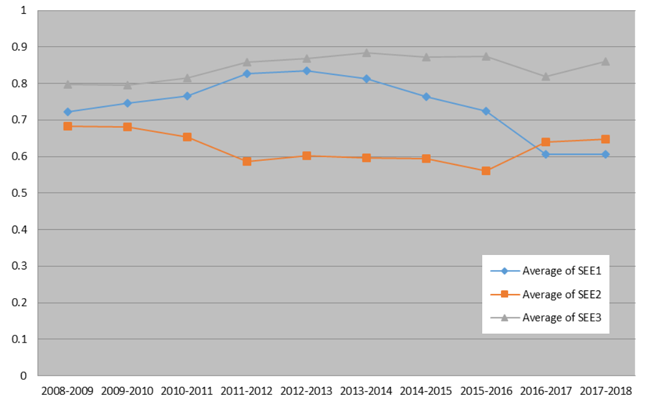 As you can see, Part 1 pass rates have dropped a little bit in the last few years, while the pass rates for Part 2 and Part 3 have been rising. Candidates take the exam parts in any order, but most candidates start with Part 1. If more candidates are sitting but fewer are passing, then Part 1 is presenting more of a challenge than Part 2 or Part 3. But the challenge probably has more to do with candidate preparation than exam part difficulty. If Part 1 is the first encounter many candidates have with the EA exam, the low pass rate is likely the outcome of candidates being insufficiently prepared. These candidates either underestimated the difficulty of the exam or the amount of study time necessary to learn all the material. Either way, their lack of knowledge caused them to fail, and as a result, some decided to drop the exam process. Conversely, the candidates that were truly ready passed Part 1 and moved forward with the exam. They continued to apply their effective study habits to their review of Part 2 and Part 3. Consequently, their prudence paid off. In this way, the increased number of strong and successful candidates pushes the pass rates for Part 2 and 3 above those of Part 1, regardless of the exam content. As you can see from the charts, there seems to be a slight seasonal trend for Part 1 and Part 2, with the dips at the beginning and end of the testing window (May and February respectively). I believe several conditions can account for these drops in performance. One obvious reason is the overlap of the testing window’s beginning and end with tax busy season. For individual tax preparation, busy season ends in April. So, my theory for May’s pass rate slump is that tax preparers are burned out and lack the energy needed to do better on the EA exam. Additionally, if the tax preparers studied for the exam in April, they probably couldn’t study very well during the rush to close busy season. This scenario also decreases their chances of passing the exam. Another reason for the low pass rates is that in May, people cannot postpone the exam by rescheduling because May is the last month of the testing window. Therefore, a number of candidates are forced to take the exam without sufficient preparation. Looking at the Enrolled Agent exam pass rates compels me to draw 3 conclusions for EA candidates. Rest assured that the overall Enrolled Agent exam pass rate is encouraging. If you prepare well, you have a good chance of passing. 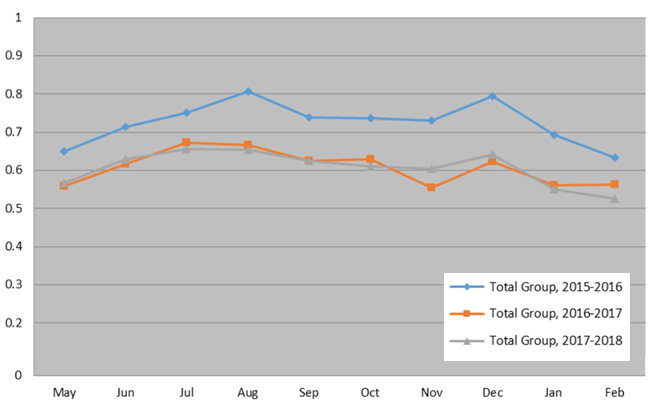 Your chance of passing goes down during busy season, so avoid taking the EA exam during this time. The end of the testing window is also a bad time to take the exam because you can’t reschedule your testing appointment even if you’re not ready. No matter what the Enrolled Agent exam pass rates are, you must do your best and take certain steps in order to pass. Total testing time for each part is 3.5 hours. To ensure you can answer every question well in this amount of time, you must study consistently for several weeks. During this time, you must also practice your time management system. You should expect to spend anywhere from 5 to 12 weeks studying for 1 part of the EA exam, putting in at least 10 study hours each week. To get a more accurate impression of what passing involves, you should learn more about how hard the Enrolled Agent exam is and how it is scored. For more help with the EA exam, check out my enrolled agent blog and sign up for my EA newsletter.